First edition. 'The second Russian expedition into the Pacific for scientific exploration, sponsored by Count Romanzoff, was commanded by Lieutenant Kotzebue, and also included the famous artist Ludovik Choris. 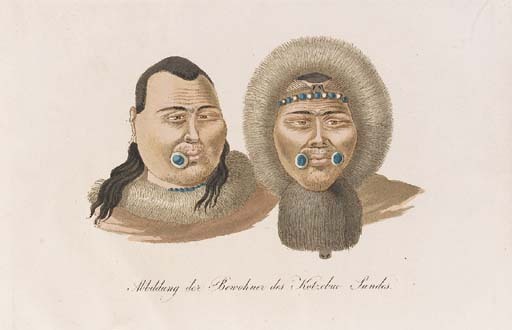 Kotzebue had also sailed with Captain Krusenstern in 1803-06. Leaving Kronstadt in 1815, the Rurik rounded Cape Horn and visited Chile, Easter Island, and the Marshall Islands. Kotzebue explored the North American coast and Hawaii and searched unsuccessfully for a passage to the Arctic Ocean. The description of the northwest coast of America is a most important contribution. The second volume contains a description of California and the earliest scientific account of the Golden Poppy, California's state flower.' (Hill). The present copy may be a subscriber's copy, as Herr Oberschenk Baron von Steinberg of Hannover subscribed for one copy on normal paper with some illustrations coloured. The edition was also available on vellum-paper with all plates coloured, or on vellum-paper with all plates finely coloured. Brunet III.693; Hill p.165; Howes K-258; Lada-Mocarski, Bib. Alaska, 80; Lipperheide La 7; Sabin 38284; Zamorano 80.